Like the works of many independent film-makers, the films of Coen brothers (Ethan & Joel) are an acquired taste and its reception on few occasions are something of a mixed bag. In fact, the brothers’ last film Hail Caesar! (2016), a screwball comedy set in Old Hollywood, although received critical acclaim left lot of viewers cold. Now with the digitally shot and Netflix-distributed The Ballad of Buster Scruggs (2018) the Coen brothers offer an interesting conceit: a feature-length portmanteau of the Western genre. The project was initially pitched as a six-part limited series, but then the half-dozen episodes were shortened and jam together to make up a single feature. 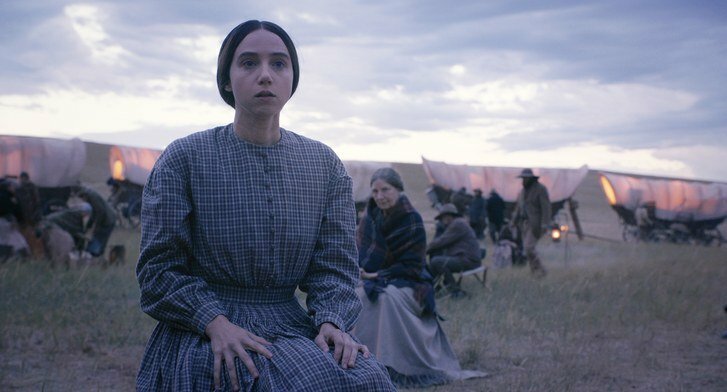 Nevertheless, The Ballad of Buster Scruggs doesn’t wholly come across as a bagful of half-baked ideas. Furthermore, it deftly touches upon the film-makers’ existentialist themes with much verve, black humor, and aesthetic inventiveness. Buster Scruggs holds up a ‘Wanted’ poster and without shedding off his mile-wide smile brags about being the best marksman in the frontier. Being the fastest gun around, Buster Scruggs leaves a trail of bodies, the result of pointless shootouts. The episode culminates with a strangely comical ending as Scruggs ascends to a different world, the same beatific smile bedecking his face, after being challenged to shootout by a young sharpshooting hotshot. At the end of the episode, there’s a shot of book’s page being turned, the fleeting glimpse at the diction even though doesn’t seem as delightfully abrupt as the visuals. In the next tale, James Franco plays a bank robber who attempts to hold up a remote bank branch, but only confronts the tough defensive mechanism cooked (which includes an armor suit of pans) up by the bank’s lone employee (Stephen Root). In ‘Meal Ticket’, Liam Neeson plays a rusty traveling impresario whose shows’ sole attraction features a limbless man (Harry Melling). The unfortunate young man advertised as the ‘Wingless Thrush’ recites everything from Shelley, Shakespeare to Bible verses and Lincoln’s Gettysburg address with startling clarity and exquisiteness. However, the act becomes less popular as the duo move from one outpost to another. The rough audiences doesn’t spare a change for listening to the eloquent speeches. There does seem to be some warmth in the relationship between the showman and artist, although they don’t talk much. But considering the abrasive nature of Old West, money issues easily triumphs over warm human connection. 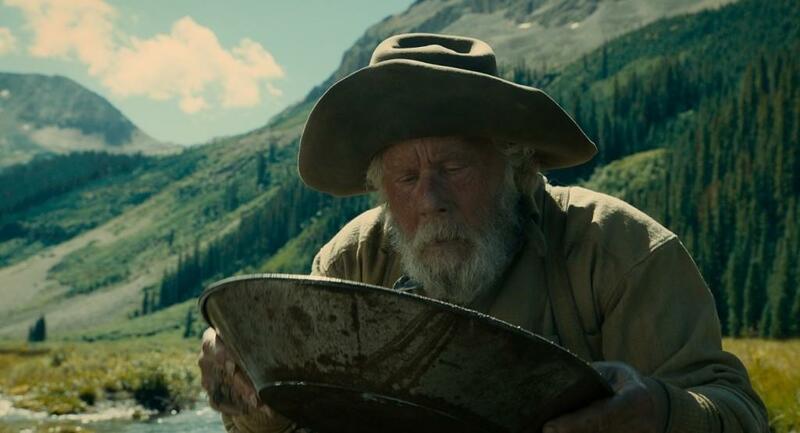 In the next episode, Tom Waits plays an old gravelly-voiced prospector, who invades a pristine, edenesque landscape to stake his claim on gold mining. While the first two tales were bit of a goofy fun, the third one was profoundly sad. With ‘All Gold Canyon’, Coen brothers’ offers a sedate tale of adventure. The fifth episode ‘The Girl Who got Rattled’ features wagon trail romance as Zoe Kazan plays Alice Longabaugh, a shy maiden with money troubles. Few days into the wagon-train journey, Ms. Longabaugh loses her only living relative: her unwise elder brother. The affable wagon-trail leader Mr. Knapp (Bill Heck) attempts to help the maiden, but unfortunate circumstances piles up throughout the journey. In the last episode, Brendan Gleeson and Jonjo O’Neill play a pair of exuberant bounty hunters traveling in a stagecoach on an eerie night. Accompanying them in the coach ride are trio of mismatched people – weary old fur trapper (Chelcie Ross), a French gambler (Saul Rubinek), and a self-righteous Bible-thumping woman (Tyne Daly). They philosophize and squabble a lot over their viewpoints of human life. 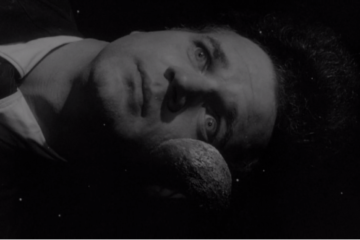 Despite razor-sharp wit, eye-popping visuals (of the mansion), and eerie atmosphere, this episode comes across as the least interesting of the six. As far as anthology feature-films go, The Ballad of Buster Scruggs isn’t extremely uneven and is constantly upheld by the brothers’ stupendous aesthetic sense. In their second collaboration with cinematographer Bruno Delbonnel (after ‘Inside Llewyn Davis’), Coen brothers brilliantly render the details of 19th American frontier with exquisite care. Bruno Delbonnel not only offers colorful snapshots of the country’s past, but also adds to the narrative’s emotional depth; for example, the shot of limbless thespian catching snowflakes on his tongue or the image of old prospector cheerily stumbling across his gold treasure. Although there’s not a theme or character that loosely interlinks these episodes, the brothers’ penchant for pitch-black humor flows throughout. As always the film-makers’ cheekily inflicts cruelty on their characters. In spite of compassion and sunny optimism, people die in an endlessly comical and sad manner as the violence that pervaded Wild West often targets innocent by-standers. The Coen brothers’ view of frontier isn’t entirely a reconstruction, but simply offers a de-glamorized perspective. The narrative, however, at times strictly attunes to pulpy, fire-side-tales depiction of West with Native Americans captured as ‘savages’. Hence this glimpse into darker reality of the West eschews certain vital historical truths (though this may not be deliberate as the film-makers have repeatedly focused on existential rather than historical or political dimensions of a setting). Anthology films unmistakably incite our temptation to rank the stories. In this case, my most favorite is the wagon-train tale. It’s the longest and most powerful of the stories, which skillfully rearranges the ideas of romance and heroism in the Old West. All of these tales observe how the efforts taken to survive another day in the harsh atmosphere keep the individuals detached and emotionless. In ‘The Girl Who Got Rattled’ those codes of human exchange or lack thereof seems to gradually relax, up until the grim reality erupts with full force. This episode also largely eschews the brothers’ trademark macabre humor and solemnly depicts the tentative relationship between Alice and Billy (aided by terrific, low-key performances from both Kazan and Heck). Therefore, the cruel trick dealt by life at the tale’s denouement brings upon profound sadness. Tom Waits’ gold-seeking curmudgeon and the lamentable downfall of ‘the Wingless Thrush’ are my next favorite episodes. Moreover, these three seems to be evenly written and staged, unlike the feel of watching a darkly funny yet under-cooked vignette picked off from a larger tale, which the other three tales gives off. The Ballad of Buster Scruggs (132 minutes) elegantly puts us through remarkable variety of moods with its six lyrical tales chronicling woeful human existence in the American Frontier. Not a masterpiece like No Country for Old Men or The Big Lebowski, but still a fascinating addition to the maverick film-making brothers’ enchanting oeuvre.